Note: if you don't see the Edit Workflow icon (Image 1), means you are running on Kanbanize version 6.0. Please, refer to the following article to edit your workflow via the advanced workflow designer. Please, contact csm@kanbanize.com if you are interested to upgrade to Kanbanize Version 6.0. 1. How to edit your workflow? Editing your Board will help you to visualize your processes and map your own workflow. You can edit the Board and extend the number of Columns and Rows (swimlanes) to get a better overview of your tasks and their priority. To edit your workflow/board, use the “Edit Workflow” icon (Image 1). In the edit board view, you can add columns, sub-columns and horizontal swimlanes. To add a new column or sub-column, use the plus (+) icons that belong to each of the default columns – Requested Area, In Progress, Done. The columns define how your cards move across the board and what phases they must pass through in order to be completed. 1. Define the Column name in the text box (new main column). 2. The Column description box allows you to write instructions for your team, regarding the intended usage of this column. (This is optional). 3. It is a must to define the Type of the column: could be either an “Activity” or a “Queue” column. - All columns where cards are being worked on should be marked as an ACTIVITY. For example: "Coding" or “Designing” are activity columns. 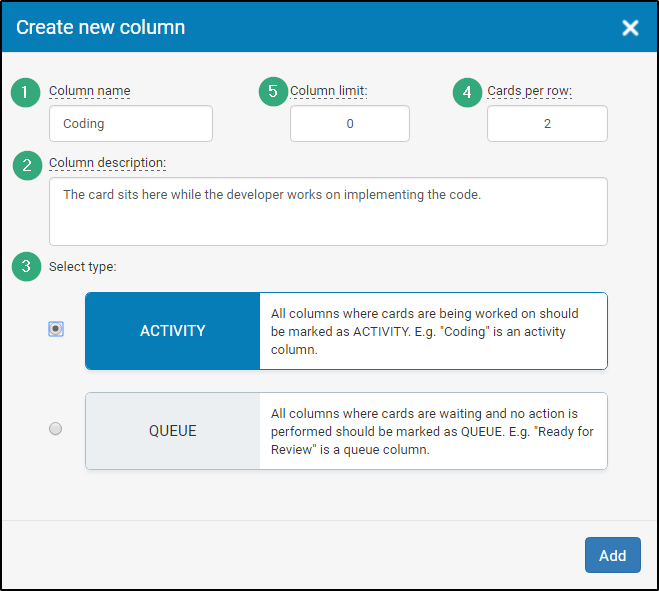 - All columns where cards are waiting and no action is performed should be marked as a QUEUE. For example: "Ready for Review" is a Queue column. These definitions will further help you to improve your efficiency and easily spot bottlenecks in your process. 4. Cards per row- allows you to define how many cards should be displayed horizontally in the column as shown in the example below (Image 2). The Column limit defines the allowed number of cards in the column at a given moment – this is known as Work in Progress (WIP). Note: Here are some useful tips that will help you to optimize and continuously improve your Kanban board. 3. Why do we need Work in Progress limits? People are better at starting work than at finishing one - the purpose of the limit is to prevent users from working on more than one or two items simultaneously. This is why the typical Kanban/lean team is focused on the work that is actively in progress, which gives the team faster output as items are going faster to "Done" and their cycle time is smaller. Note: We recommend to start by setting up a WIP limit of 2 per person, but you need to take into account the number of users on that board. If you have 4 members and each of them has a personal limit of 2, your Activity column should have a limit of 8. This is a basic foundation. Important: The system allows you to have a "WIP limit" on the “In progress” overall stage. 3.1 Whether this limit can be exceeded or the system stops you to pull a card if another one is currently in progress is controlled by a setting in the Board Setting panel. 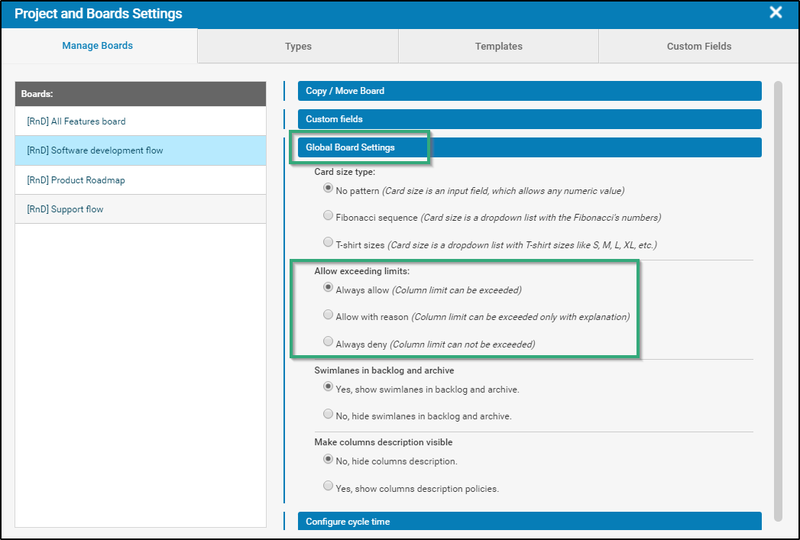 Select Board Settings -> Global Board Settings – >Allow exceeding limit. To edit a column (change column lane, limits, description, type) -> click on the gear wheel icon. To set a background color of the column -> click on the color palette and choose a preferred color. 4. How to add new swimlanes? Swimlanes - you may have as many swimlanes as you want in order to organize your tasks. To create a new swimlane – use the Add new swimlane button. - click on the gear wheel icon to add a name of the swimlane -> click on the check mark to confirm it. - Use the color palette to set a background color of the swimlane. It is recommended to use the colors from warmer(top) to colder (bottom) to visualize better the level of importance of the different work categories, distributed in the lanes. For example, the swimlane "Critical" should be colored red and put on top of your board while the swimlane "Internal" can be colored in blue and placed at the bottom of the board. - To move the swimlane (up, down) on the board -> click on the arrow and drag and drop the swimlane to the desired position. - To put a description of the lane -> click on the question mark icon. To move it (up, down) -> use the arrow. - If you want to delete the swimlane -> click on the trash bin icon -> confirm the action. 5. How to insert a WIP Limits per Cell? When you click on the edit icon of the swimlane, there is a limit field in each cell, where you can enter a number. Input the number and click on the checkmark to confirm it. This way you can apply different WIP-limits for the columns in the different swimlanes.